It’s your sister’s/mum’s/daughter’s birthday. It happens every year, funnily enough. Should you reach for the same old perfume you buy year on year – or something a little bit different? Well, we’ve scoured the net to bring you the coolest dog-inspired jewellery for those who adore their four-legged friends. No cheese here. With designers like London-based Annina Vogel producing vintage-inspired animal jewellery worn by the likes of Keira Knightley (swallow ring, £1,250) and Kate Moss (gold and pearl horseshoe ring, £450), animal jewellery is making a big comeback. Here’s our top five list of dog jewellery to make you drool. 2. 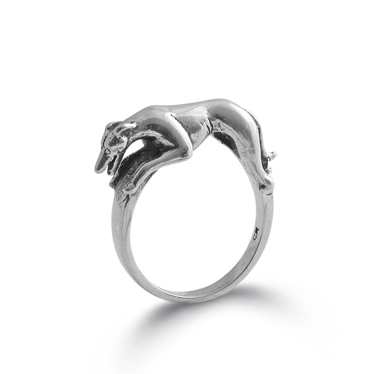 We are in love with Christopher Robin’s Greyhound Ring, available in both gold and silver. Elegant and sleek, the silver version is a steal at around £42. I’m dropping hints right now and I don’t even have a greyhound. 4. This Oh So Sweet Boston Terrier Pendant is a total bargain at just £4.74. How about ditching the Easter eggs this year and buying your loved ones a pretty little gift like this instead?